No not me, I'm not the genius.....but do you ever see something and think, "Why didn't I think of that?" It happens to me daily! This was sent to me by my math coach at school and I got so excited. 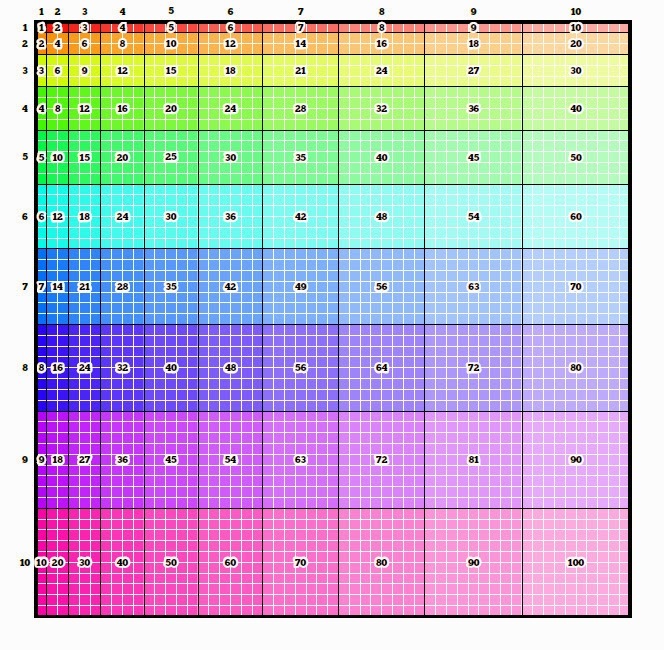 It is a truly visual way for kids to see the multiplication tables. I am going to print a class set and laminate them tomorrow. Most of mine have already memorized through the 12's but for my friends who are struggling this will help them so much. I don't know where she actually got it but there are credits at the bottom of the page. You can get it here. I love this! So we are really digging deeper into our comprehension skills and last week we were talking about making inferences with poetry. This week our skill is supposed to be drawing conclusions, so as I was planning I began thinking. Are they the same thing and if they aren't how do I explain it in a way children can understand? I started off with a google search and BINGO the very first thing I found was a blog by Jennifer Wright with an amazing explanation and a perfect graphic. She says, "We infer when we draw conclusions and that there are other processes involved including drawing conclusions, making connections, making predictions, etc." You can read her excellent post here. After reading, it all made perfect sense, I already knew it. I just needed to organize it in my brain and this visual helped me. I know it will help my kiddos too!